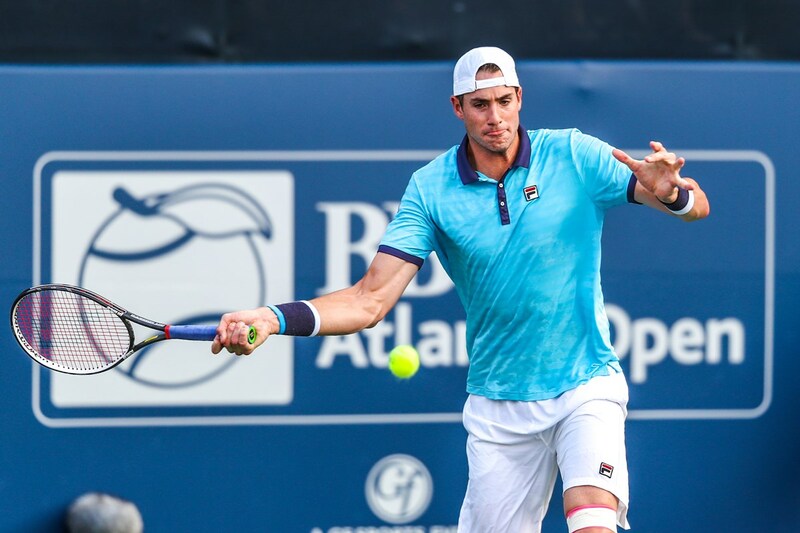 John Isner picked up from where he left off in Newport, with a 6-3, 6-4, second round win over Vasek Pospisil, on Wednesday Night. Isner dropped just four points on serve, on his way to the straight set win. The No. 2 seed also served 10 aces, with a 64% first serve percentage. The former Bulldog great says it feels good to be back in Atlanta. Age was but a number for 20-year-old Tommy Paul today, as he defeated veteran player Malek Jaziri of Tunisia, in three sets, 6-7(5), 6-4, 6-3, during the day matches. Paul, who reached the main draw through the qualifying rounds, is the youngest player remaining in the draw at the BB&T Atlanta Open. His quarterfinal appearance will be his first on the ATP World Tour in his career. A close competition from the start. It was no surprise the match reached a deciding third set. The two battled in the first set, and it was clear neither would go down easily. Despite a comeback from Paul in the tiebreaker from 4-0 down, Jaziri earned the set on a double fault by Paul. Play in the second set almost mirrored the first. Great ball placement by both players made for exciting points throughout, but a long backhand by Jaziri allowed Paul to close out the set. Paul, who has played three sets in all four of his matches at the tournament, prevailed in the final set, running down everything from drop shots to volleys by Jaziri to reach in the quarterfinals. No. 3 seed, Gilles Muller had to do a little digging to find his way in his first match. The ATP World Tour veteran from Luxembourg edged Quentin Halys, who entered the main draw as a qualifier, in three sets, 6-4, 6-7(1), 6-2. Both players struggled with serve returns the first two sets. Games were tight and each point critical as the second set came to a close, with neither player able to break the other. Forced into a tiebreaker at 6-6, Halys jumped out to a quick lead, and dropped only a single point to claim the second. Muller, who has had a career-best year so far in 2017 including two ATP titles, reigned in the errors that plagued his play in the previous two sets. Breaking Halys in the third game to lead 3-1, Muller appeared to relax and put the momentum in his favor. He did not waste it, closing out the final set on an ace up the middle in classic fashion. Wednesday action on the AJC Grandstand Court began with an upset as the tandem of Andres Molteni and Adil Shamasdin, outlasted the No. 2 seeded duo of Ryan Harrison and Michael Venus 6-4, 0-6,1-0. For a doubles match, there were long rallies. Harrison and Venus failed to capitalize on breakpoints, winning just 14% of break point opportunities. This allowed Molteni and Shamasdin to take the first set. Harrison and Venus, the 2017 French Open champions, played the second set determined to send the match to a tie-breaker. Their strong serving continued and they consistently found holes that left their opponents scrambling to return the ball- forcing errors. The duo quickly took the second set 6-0. Molteni and Shamasdin decided to rush the net, every chance they had in the third set match tiebreaker. This helped them edge out Harrison and Venus 10-7 in a close breaker. They will face the pair of Wesley Koolhof and Artem Sitak in the quarterfinals.